Beautiful little upstairs restaurant owned by chef Will Gill. His culinary skills are world class. Really enjoyed my meal here. Food was excellent. Portion sizes are good - not typical of restaurants of this calibre, particularly at the very reasonable prices charged. The owner cooks all the food himself and clearly has a passion for what he does which comes across well. Would highly recommend! My wife booked here for us for my birthday, what a great place! The food was fabulous and the staff were friendly and efficient. All in all a great night. There are not many restaurants in the town and we chose this one on our second night. We found the food great using homemade bread, local produce and well-presented. The waiters were friendly, helpful and efficient. We will recommend to others. A tremendous dinner. An unimposing outside but delightfully done inside. French / Scottish fare, served with taste and elegance. Who could imagine French specialties with haggis? French onion soup was excellent and with a unique taste - sweeter than usual, but delicious. Seafood specials were most enjoyable and the fish was fresh that day. Prices very reasonable given the quality of the food and was a top quality meal at a comfortable price. In Kirkcudbright for only one night and found this gem after we couldn't get a table without a reservation at another restaurant. The Auld Alliance's menu was creative and contemporary, the food was superbly prepared and the staff made our visit incredibly pleasant! Thanks! The food was excellent and the service was first class, no waiting, the meal just flowed. Perfect timing. I think if we were ever in Kirkcudbright again. we would certainly eat here more often. Our menus arrived with complimentary ginger and garam masala bread which was so delicious, I thought it would fill me up too much! I love fish and the hake was one of the best fish dishes I've had in a long time. My husband's rump steak came medium rare exactly as ordered. We were only in Kirkcudbright for the weekend which was a pity as I'd have loved to have sampled some of the other dishes. Food amazing! Such clever cooking by chef Will. The scallop and chirizo starter was one of the best I have ever tasted and the homemade bread was delicious. The front of house staff were very attentive and nothing was too much trouble. Well done guys. Wonderful, warm welcome and superb food from very talented chef Will Gill. The belly pork was delicious and the creme brulee divine. It doesn't matter how long we leave between visits, the food never disappoints. We'll be back as soon as possible. We ate here twice. After the first meal, my husband was so impressed he asked if he good book for another night and request a specific dish not on the menu. The staff were happy to meet his request so we had a second visit and another really tasty meal. There is a good choice on the menu and all the dishes we tried were very well prepared and cooked. Nice ambience, attentive service, good food and excellent wines. This small first floor restaurant was a surprising find in this town and should be a must for dinner during one's stay in Kirkcudbright. 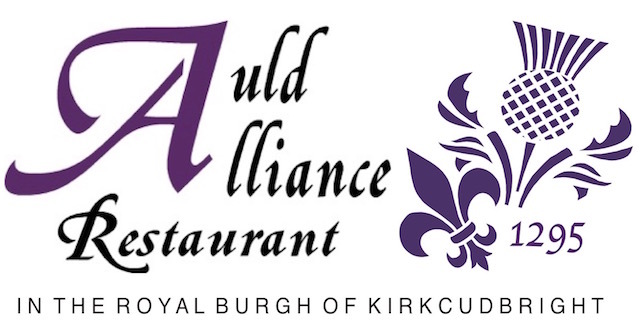 We had a wonderful meal at the Auld Alliance on Thursday evening. Service was friendly without being intrusive, menu was impressive and locally sourced, wine list was extremely reasonable and the standard of cooking and presentation was outstanding! We are a very picky couple and everything exceeded our expectations - thanks to you all, would highly recommend this restaurant and will definitely be back in the not too distant future. This is as good as people say it is. Fresh, local produce cooked very, very well. We liked it so much we booked for next week! Will obviously has a passion for cooking and this was displayed in the food served. A black pudding and haggis starter and a smoked haddock fish cake starter, both delicious. For mains, the paupiette of plaice and a steak for myself, again superb. Unfortunately we were too full for desserts. Wish I had found this restaurant last week as would definitely have been visiting again. All reasonably priced. Another fantastic experience eating here. Lovely atmosphere, relaxed and a great place to have an enjoyable meal. I'll be back.